In nature, warning signs abound for things you're not supposed to eat. The cactus has thorns, the lobster has claws (but mad props to the guy who figured out a way to get at its delicious meat), and poo smells like, well, poo. Under the fluorescent lights of a bustling Wawa, the signs are there, but you need to look a little closer. 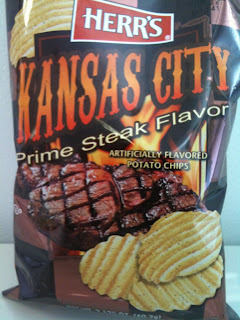 After two artificially flavored successes, Herr's suffers a face mangling fall from grace with their Kansas City Prime Steak Flavor potato chips. If the shittily designed packaging was any indicator of what lurked inside, I should have heeded its warning. The off-putting "Western" font whose name I can't place (because I'm not well-versed in fonts), the brown-checked background, and a floating steak that looks like it came from an old Sizzler advertisement. Clearly Herr's is paying the flavor fellas more than the graphics guys. I could have opened a packet of Lipton Onion Soup Mix and gotten the same result, an overly salty and artificial crunch that could only be delicious if I were exiled to the eternal blackness of a space station behind the moon, and there was nothing left to eat after the other dude lost the coin toss. Space station or no, there's a better use for a dollar. Buen provecho. why u always gotta be dissing WA-WA? Agreed for the guy who found a way to get at the lobster. Cactus is also delicious though. Stewed in tomato sauce, I sampled it in Cancun this past summer. Love your blog!